Let’s talk about yeast prior to the 20th century. Back then, you did not go down to the grocery store and pick up packets of dried yeast. Instead, you probably got your yeast from the local brewer, either skimmed from the top (kreusen), or from the bottom of the cask after decanting (lees). And then, you would make up a jug or crock of a slurry of flour or potatoes to keep it alive in. 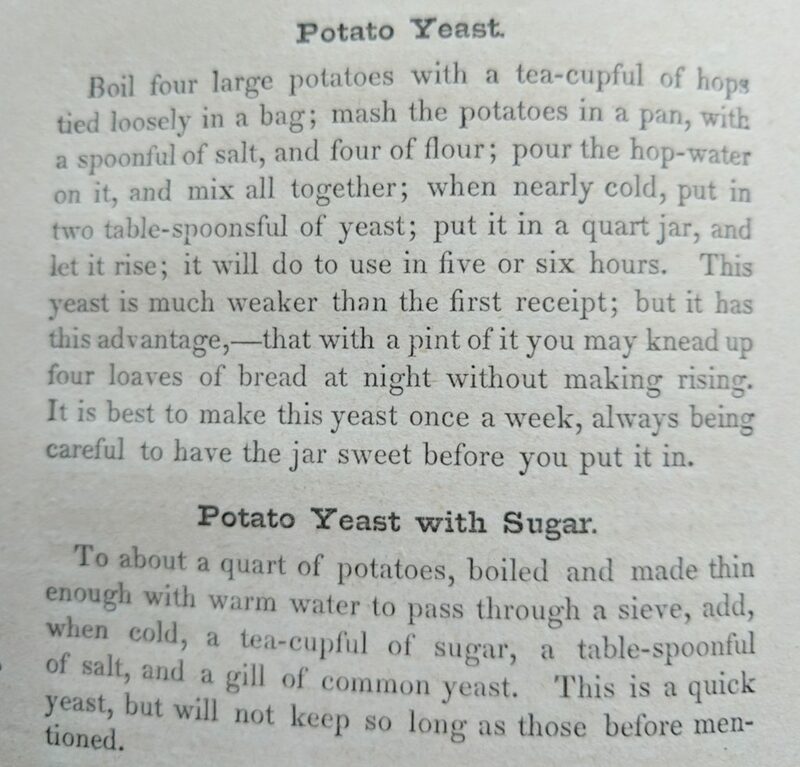 19th century books are full of recipes for “yeast”, but these are not recipes for making yeast, they are recipes for maintaining a yeast culture. It is from this liquid culture that you would get your yeast for baking. And as you took some away, you would add additional liquid and nutrients to replace it, exactly the same as maintaining a modern sourdough starter. Toward the end of the 19th century, you start to see references to purchasing cakes of yeast, and even occasional recipes for making dried cakes of yeast. But the majority of the recipes I have all use liquid yeast cultures. Another oddity by modern standards is that many of the yeast recipes call for adding hops. Keep in mind that for hundreds of years, bakers had been getting their yeast from brewers, which was obtained from the ale vats themselves. This means that the yeast was well-flavored with hops. And since the bread was made from that yeast, the bread had the flavor of hops as well. So for people of the time, bread that did not taste of hops would have been odd. Of course there was another reason for the hops that was well-known at the time, hops are a preservative. So yeast cultures made with hops would last longer before going sour. This is not so much a problem today with refrigeration, but back then it could be a significant issue, especially in the warmer months. But there’s another difference between modern baking yeast and the yeast of the past. Modern yeast is FAST. I mean lightning-fast compared to yeast of the time, even the ones not labelled as rapid-rise are very much faster. A lot of the old recipes call for batters, sponges and doughs to be risen overnight. Seriously, don’t do this with a modern yeast unless it’s cold in your house. In that amount of time, a modern yeast will have consumed everything and exhausted itself. And sure, it’s convenient to have bread rise so much faster, but it does change things, especially the flavor if the sponge or dough was meant to rise overnight. So, if this matters to you, consider making your own yeast solution. You can obtain good brewing yeast (and hops) from home-brewing supply shops. There might even be one near you. These yeasts come in both dry and liquid form, either will do, but you want an ale yeast, not a lager, wine or champagne yeast. Then just use a recipe like the ones above, and add that yeast to it. I keep mine in a large mason jar in the refrigerator. Just pull out as much as you need and let it sit out for a bit to warm up before using. the results I have gotten so far match up with the descriptions in the old cook books. A sponge left overnight was just right in the morning. And another that called for a two-hour rise was also right, when using modern yeast would have taken only 20-30 minutes. Elizabeth E. Lea, Domestic Cookery. Cushings and Bailey, 1866. ← Your ancestors had leftovers too.